Prof. Jong-Beom Baek and his research team are looking at the screen. From left are Prof. Myung Jong Ju, Postdoc researcher Myung Jong Ju, and Prof. Baek. Solving a major DSSC catalyst problem, using Se counter electrode. A team of Korean scientists, affiliated with UNIST has revealed a potential counter electrode (CE) material, which can help reduce the cost of DSSCs and thereby accelerating the commercialization of DSSC technology. The team−made up of scientists from Dongguk University, Korea University, KAIST, and UNIST−published their work in the current edition of Science Advances on June 17, 2016. 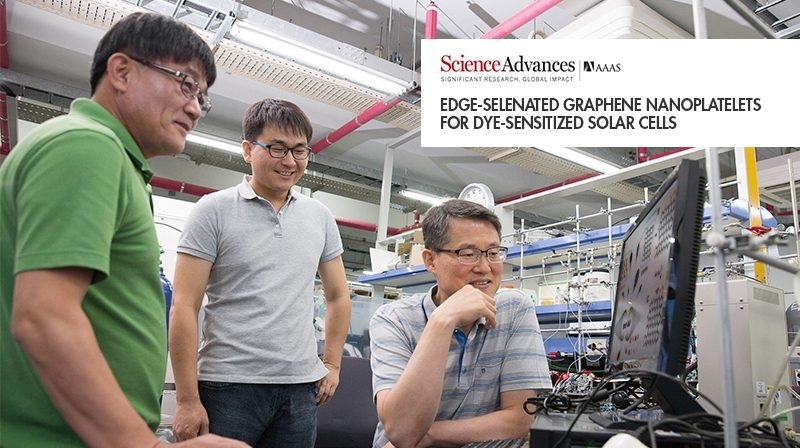 The DSSCs, which produce electricity from sunlight by the photovoltaic effect consist of a dye-coated titanium oxide photoanode, an electrolyte, and a counter electrode (CE). While Pt-based materials are among the most efficient CEs, the high-cost and the rarity of Pt significantly hinder its practical application in DSSCs, including mass production and commercialization. The efficient counter electrodes can reduce internal energy loss in DSSCs and thus produce higher current densities and fill factors. Therefore, researchers have been actively looking for alternative CEs and the best candidates were carbon-based electrocatalysts. 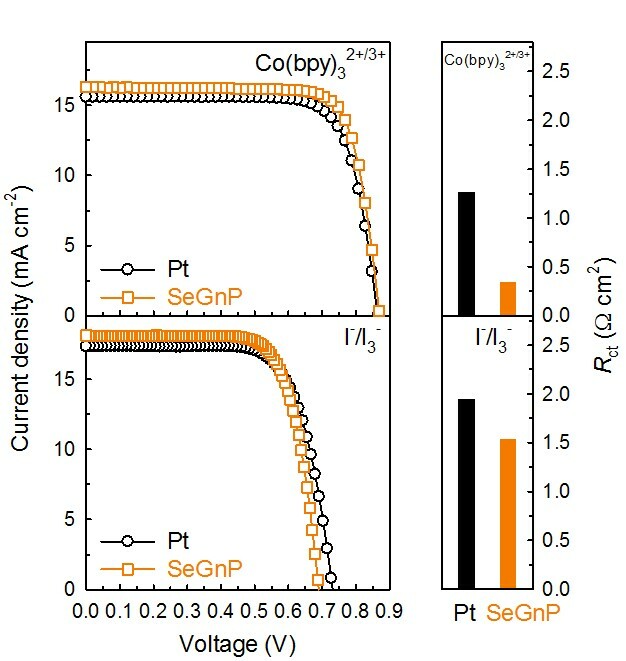 A major problem, however, with carbon-based CEs is that they are active enough in Co(II)/Co(III) electrolytes (and have a high PCE, here), but not sufficiently so in I-/I3- electrolytes. 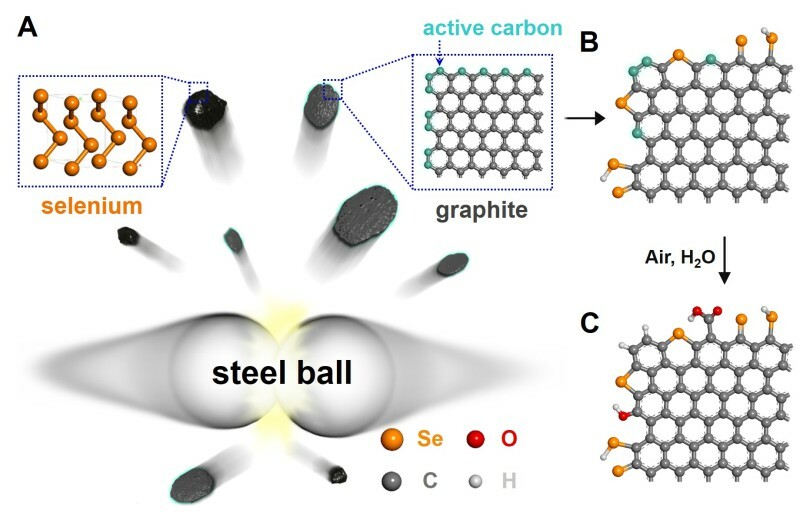 However, the research team has overcome the problem of carbon-based electrocatalysts for DSSCs with their new catalyst made from edge-selenated graphene nanoplatelets. 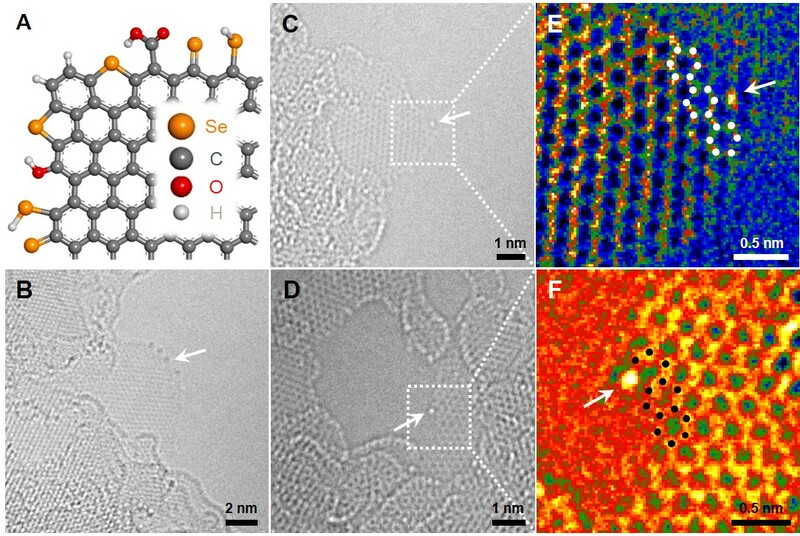 In exploring alternative counter electrode materials for Pt-free DSSCs, Prof. Jong-Beom Baek and his team developed a new edge-selenated graphene nanoplatelet (SeGnP) CE material by mixing graphite and selenium powders together using high-velocity stainless steel balls in a planetary ball mill reactor. According to the team, the DSSC based on Se counter electrode exhibits outstanding electrocatalytic performance with ultimately high stability and low cost. In this respect it performs better than Pt-based CEs. This work has been supported by Creative Research Initiative and BK21 PLUS (Brain Korea 21 Program for Leading Universities & Students) programs through the National Research Foundation (NRF) of Korea. Myung Jong Ju, In-Yup Jeon, Hong Mo Kim, Ji Il Choi, Sun-Min Jung, Jeong-Min Seo, In Taek Choi, Sung Ho Kang, Han Seul Kim, Min Jong Noh, Jae-Joon Lee, Hu Young Jeong, Hwan Kyu Kim, Yong-Hoon Kim, and Jong-Beom Baek, “Edge-selenated graphene nanoplatelets as durable metal-free catalysts for iodine reduction reaction in dye-sensitized solar cells”, Science Advances, (2016).